After many years in TV production, Steve decided to work on bringing to life one of his dreams: to open a bed and breakfast with his family in southern Vermont. Steve’s B&B, Treehouse Village Inn, is in a breathtaking location: it’s surrounded by forests and rolling hills, and within an hour’s drive of popular ski resorts. 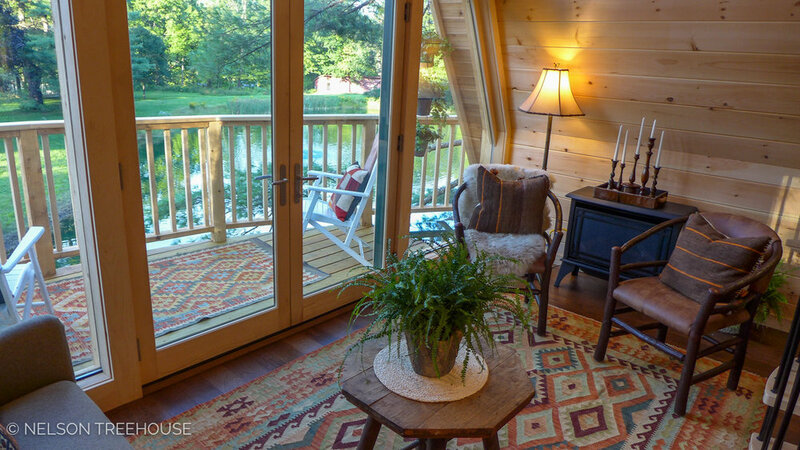 The treehouse rental roosts near the B&B’s main lodge and is directly adjacent to a tranquil pond. The treehouse is full of special features, including our first-ever treetop waterfall! Water flows off the deck into the pond below, tying the treehouse to its surroundings. One pine, one willow, and four posts support the treehouse. The post at the front is made from a cedar log. The A-frame design is a nod to the aesthetic of local ski lodges. A lighted staircase leads to the deck. This section of the deck faces west, making it the prime spot for soaking in sunsets. The crew added copper siding and an open grate at the base of the roof—this technique keeps snow moving off the roof and prevents icy buildup. Big thanks to local carpenters from Peachtree Builders for helping us craft this epic roof! The views from the deck are truly spectacular. Imagine what it must look like now, with the trees changing color! Inside the door lies a “boot nook,” where guests can remove their shoes. The main room holds a wet bar, comfy seating, and a spiral staircase. A custom live-edge bar top adds rustic charm to the wet bar. A full bathroom gives this treehouse the amenities of a modern hotel room. The spiral staircase winds up to the sleeping loft. Near the door, the crew used flooring material as wall paneling. This is a simple way to create an accent wall. A soaring wall of windows and glass doors provides spectacular views of the pond. Custom details like this built-in window seat add interest and character. The cozy sleeping loft is framed by the steep roof pitch. Guests do not even have to leave bed to soak in the treetop views! With heating, running water, and electricity, this treehouse retreat is ultra-luxurious. We’d like to thank Steve for having us to help bring his dream to life. It’s been such a joy to work with Steve on the show, and we wish him and his family all the best with their beautiful B&B! You can learn more and book your stay at Steve’s B&B, Treehouse Village Inn, on his website: treehousevillageinn.com. 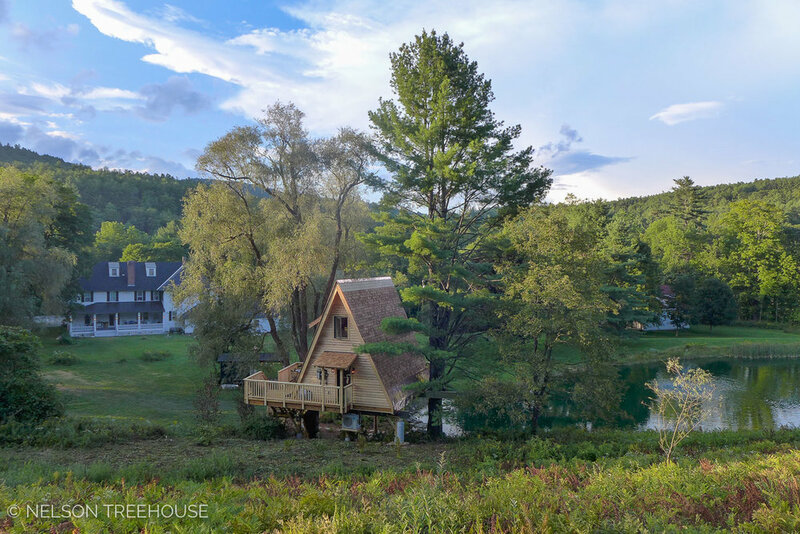 We hope you’ve enjoyed taking a look inside this stunning Vermont treehouse! Let us know your favorite part in the comments below. You can take a video tour of this treehouse at housebeautiful.com. 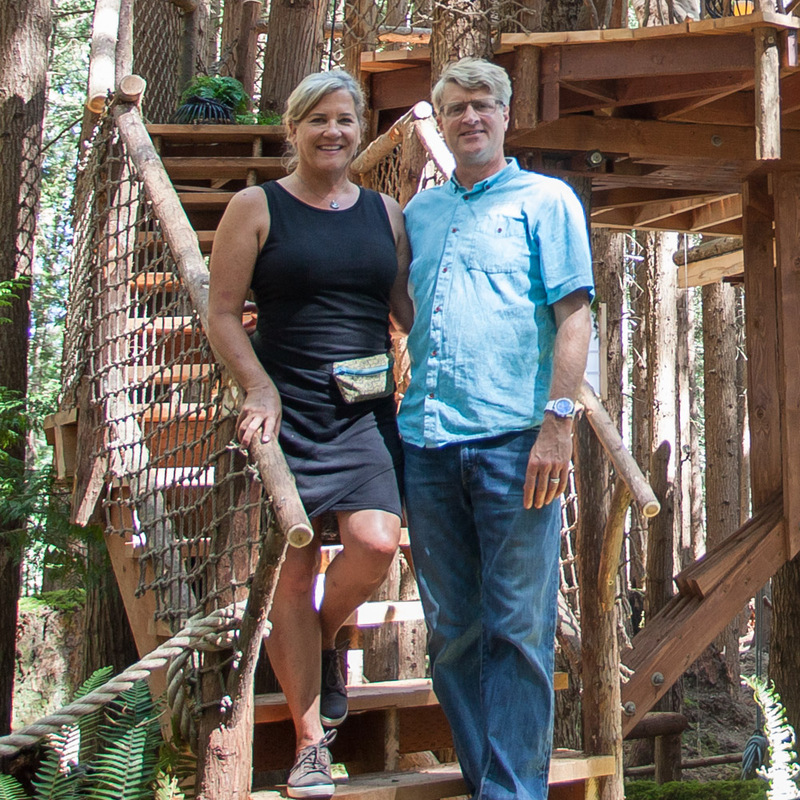 And take a look back at all our photo tours from Season 11 of Treehouse Masters.